This company sends apprentices to overseas for as long as six months, though they are not its employees. What company is it? Those personnel who carry on international business are indispensable for the Swiss industries as they largely address the markets worldwide. It is also true that the industries owe much on personnel for innovation, for which Swiss companies incessantly strive to stay competitive in the international markets. That said, why does this company invest that much to grow its personnel? What is the management philosophy behind? With these questions in mind, I interviewed Mr. Dipak Mane (Photo), Director of Global Human Resources of the company, Bühler Group (https://www.buhlergroup.com/global/en/home.htm). Founded in 1860, Bühler continued developing over more than 150 years as a family-owned company. Based on the original strength of iron casting and roller mills based on the iron, the company developed to become the first-class company in the world markets for the its excellent technologies. During the course of development, Bühler steadily enlarged its business areas to include those areas related to its core competence of iron casting and roller mills. “The company presently provide machines and solutions indispensable for food industries, ranging from raw materials such as grains, rice, cacao and coffee to medium- to end-products, and livestock feed (Source: https://premium.ipros.jp/buhlergroup/). Bühler further extends its business edge to support sustainable mobility and the total solutions to ensure production of the healthy food. What are policies of the HR department to ensure competitiveness in international markets? Two things are most important. One is the sense of purpose, i.e. to be always conscious with the purpose of technologies. The sense of purpose has been the spirit of our company since its birth. To serve this purpose, we have been investing 4 to 5 per cent of turnover in R&D. The second important thing is the profit. We must hold these two things together. The family-management enables to maintain these two essential points. Top managers may manage the company in line with their own management philosophy and make decision swiftly without interference by external stakeholders. The HR policy is to put the management philosophy into practice. The purpose of Bühler’s HR policy is to maintain employees motivation high. Those are people who always improve their skills and knowledge and who are interested in doing better job all the time. Such employees continue self-improvement all the time by participating in training opportunities. In this sense, our company is a training company, such as a university. We invest much in trainings. One per cent of Bühler’s personnel costs is spent in training and we plan to raise it to two per cent by the year 2020. In Swiss Francs, the investment is about 6 – 9 billion Swiss Francs per year. One employee takes 1,85 days of training per year. We plan to increate this number to be 2 in the year 2020. As for apprentices (those young women and men of 15 and 16 years old) who just stepped in the professional lives, Bühler has a history of 100 years of their trainings. The total number of the apprentices we trained adds up to 7,700. We started an overseas training program about ten years ago. About 600 apprentices who come to work in Bühler every year are sent to various countries as a part of the training program. One half of them stays in Switzerland and the other half go abroad, such as Austria, China, India, Brazil and South Africa. What are reasons of such a HR policy? What do you think of a risk that those employees who obtained higher skills and competence may leave the company for better salary? Our CEO thinks that we would have to keep a number of employees with low skills and competence who may not leave the company, if we do not provide them with training opportunities. In fact we see positive results. An employee retention rate of Bühler is as high as over 73 per cent. One thousand apprentices out of those who came to the company for training join Bühler as formal employees. We witness significant results in the young people who leave their hometowns to meet the new people in other countries with different cultures. In general terms, many people wish to stay in the company that provide trainings, as they may improve their competence and obtain new skills such as management. Young apprentices watch during their training period how long-lasting employees develop themselves, and project their own future over the elder workers. This makes the young to wish to continue working in Bühler. What does the company obtain from this unique training? We obtain the diversity and inclusion (D&I), which are indispensable for innovation. Bühler has a built-in system for people with a wide variety of background to work together. Though it is surely a large investment to send apprentices to overseas locations for several months, the return is huge. The young learn through their day-to-day work cultures, languages and the market needs. We not only send apprentices to overseas. We also provide an online program for them to stay in touch with the Swiss Headquarters during the overseas training period. It is a remote sit-down training based via video conferencing (ClassUnlimited). The program is available starting from Switzerland and China to become available in other countries. Such a training lies in the centre of the company. Apprentices obtain skills and leadership in order to brush up the sense of purpose. We do not expect a return on investment (ROI) in the short terms, because it is our belief that the smart employees are the core resource of a company. We always seek ways to improve competence of employees. Means to do so is not limited to trainings. We are aware that training is a long-term investment and continue increasing the variation of the training. It should also be noted that those who enjoy benefits of trainings are not limited to a small number of employees who are expected to take senior management positions in the future. It is Bühler’s management philosophy that we address all the employees for trainings. In what ways would HR department contribute to the innovation? The birth of innovation requires a certain ecosystem, or a chain of various factors. The HR department is an integral part of the eco system of innovation. For example, the HR provides the office environment that enables employees to communicate better with each other, encouragement of collaboration with Universities, and sponsor some research programs in Universities. In Bühler, we organise an innovation competition participated by 2,000 employees worldwide. This means 15 per cent of all the employees participate in the competition. We must find those needs which market has not yet found. Our Chief Technology Officer (CTO) always tells us that 99 per cent of knowledge is outside the company. We must continue looking for good ideas all the time. For this purpose, we will continue working with those outside the company, including start-up companies. What kind of company would Bühler want to be in the future? We want to see Bühler for which employees want to work most in the world. Young employees know well what such as a company is all about. They wish to work for a company that has social purposes. They want their company contribute to something that help people, such as to alleviate adversarial consequences of the climate change, etc. Social contribution is Bühler’s tradition. We wish to continue investment in R&D. Going beyond Industry 4.0 is only a part of the company’s future. We want to see Bühler running the top of the industry worldwide. One example of our contribution is a new innovation centre, Cubic innovation centre (Photo), to be open in February 2019. We invested CHF 65 million in Cubic. Cubic is a contribution to the industry. We have been organising an event called, “the Networking day”. The event is to open factories to people from outside. We will be able to invite the public all the time after the opening of Cubic. We know that people are essential resources of a company but rarely see the one like Bühler that provides opportunities for the young apprentices to experience the world and for all the employees life-time training programs. This would surely create employees with eyes wide open and who may produce products, systems and services with the sense of purpose. It is said that Diversity and inclusion (D&I) is essential for the innovation. Bühler proves this is true. The company’s success in the innovation owes highly motivated people with diversified knowledge and background, and an environment that enables them to work together. 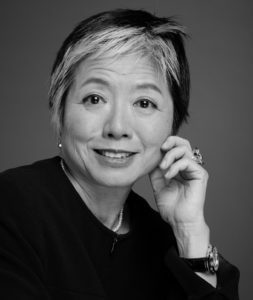 Please enjoy an interview of Ms R, an executive of a major Japanese company in Mexico, who enthusiastically talked about the reasons why the cross-cultural training is a major key to success in international business with Japan. Author Yoshiko KURISAKI　（栗崎由子）Posted on 05/11/2017 21/03/2019 Categories Cross cultural marketing, Cross-cultural management, Japan, Japan - Business, Japan - Business culture, Japanese cultureTags Business, Communication, Cross-cultural Training, International business, Japanese, MexicoLeave a comment on Audio, Why are cross cultural skills crucial for international business with Japan? Please take a look at the photo below. This is the shot that impressed me most during my stay in a conference held in the suburbs of Amsterdam, the Netherlands. The session was attended by Professor Geert Hofstede, who is well known to the world for his work of the Six Dimensions of the National Cultures. His theory is taught as the basis of international management in business schools worldwide. He is the man on the right side in the photo. Inviting the great Professor, the session must be formal, at least if the same happens in Japan. This was not at all the case the Netherlands in my Japanese eyes. Amazing point 1: Do you see a red package at the bottom of the lectern? This is the gift for the Professor just passed to him a few minutes ago. As the gift is heavy, the MC of the session (the lady in the middle of two men in the photo) took it from him and put here. I knew she did it for kindness but couldn’t believe it. In front of the distinguished Professor, putting the gift for him on the floor? If it were in Japan, she would have carried the gift with both hands in respectful manners and put it on the distinguished cushion placed on a side desk prepared for this purpose. What amazed me more was the fact that The Professor was not upset at all. Look at how calm he was in the photo. 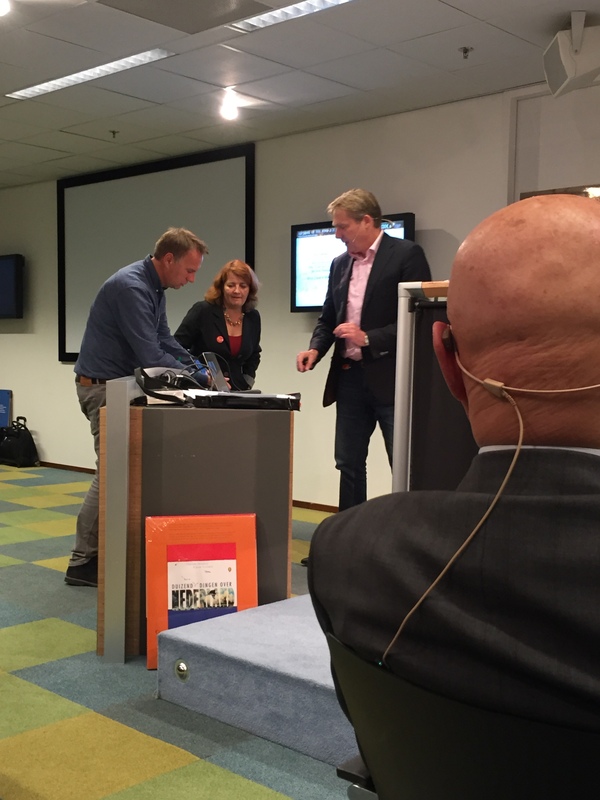 Amazing point 2: The second gentleman from the right in the photo is a senior executive of IBM BeNeLux. He was a keynote speaker of the session. He was dressed in jeans in such a session in front of the great professor! I know I was looking at this scene in the Japanese value set. I know I shouldn’t judge the Dutch culture applying the Japanese criteria. It’s a great fun to see in what ways attitude to the power and authority appears in different countries. I enjoyed the relaxed Dutch ways! Pick of the week from Japan, 28 Aug. – 1 Sep.
A young man with his hair died in blond, high school girls in their school uniforms are seated in the assembly hall of a city hall. The mayor and municipal executives sitting in front of them show a serious face. These are 25 youth “members of the City Assembly” who responded to the public invitation for the youth members of the Assembly addressed to the age from 16 to 29 years old in Shinshiro city, Aichi ken, on 22nd. It is not unusual to see a sham assembly held in schools or even some cities as social education. In contrast, Shinshiro city let the youth assembly to decide in reality the use of the budget of the city, i.e. how to use the tax. The sum of the budget is 10 million yen. Sum, For the business that I name “a youth assembly” and launched from the year before last, inspection occurs successively from all over Japan. This initiative, named “the youth assembly” started two years ago. A number of visitors come to see the assembly from all over Japan. I found the news hopeful for Japan! The voting rate of the country has been decreasing since years, even to the level of about 30%. It has been even worrisome that the voting rate of the young generation, the 20s and 30s are lower than the elders. Many young voters felt them powerless to vote. They felt that one vote can’t change even the society. It is worrisome for the future of the country. The original idea of the youth assembly of Shinshiro city started by an initiative of a young citizen, Shuhei Takeshita (26 years old). He was shocked to see a number of European young men and women of the same generation seriously debating political issues when he visited an assembly of the young who are from the cities whose name meant “a new castle” held on New Castle in the UK. Shuhei never thought of policy issues as his own issues. He immediately though that it was not a matter of language barrier but a huge gap in the interests of the youth to policies of their own cities. Returning to his city, he started organising a group to study policy issues of Shinshiro city. It was a great story! Shuhei turned his shock in the UK to a concrete action. He involved others, instead of staying being sorry for his lack of interests in local policies in the past. One person can’t change the society overnight, but there are always something which one can do for the change. It is a health sign that there are young people here and there who try to improve the society through work with municipal assemblies. SISFES (Shimizu Itasha Seaside Fes), a festival of cars decorated by characters of animations and Manga, called “Itasha“, was held in Shimizu Marine Park and its surrounding areas (Shimizu-shi, Shizuoka.ken) on 20th August. Approximately 170 cars, and approximately 30 motorcycle got together from in and outside the prefecture including metropolitan Tokyo area and the Western regions of Japan. Enourmous nergy of manga and anime lovers contributes to the regional economy. A number of events of Itasha are held all over Japan every year, in cities and rural areas, even such remote spot as a water dam site. What an energy of those who are enthusiast of cars heavily decorated by anime characters! What’s behind of these flourishing Itasha festivals is the need for great events that will provide business for local shops, restaurants, hotels, etc. Are women member of the Diet abandoning their duties if they are pregnant? A female Diet member who reports the pregnancy is often criticised as the duties abandonment in Japan. Against background that the country has a very small number of women involved in political decision-making process, some advocate need for maternity and parental leave for the members of the Diet to facilitate women to join in the policy debates. The ratio of the Congresswoman of the Japanese House of Representatives is 9.3%, and it is the 164th of the world, according to a survey of the Lower House undertaken by an international organization “Inter-Parliamentary Union” announced in July. It is surprising that there is no official rule of maternity or child-care leave for members of the Diet or assemblies of the local governments in Japan. Why do women still have to be criticised because of pregnancy in the country where the gender equality is established in the Constitution? Good news at least is that women members of the Diet started fighting against those criticism, as Ms Suzuki does. It is a sad reality of Japanese society but one must admit that women must stand up and raise their voices against unreasonable criticisms that block their professional development, even in the 21st century. Author Yoshiko KURISAKI　（栗崎由子）Posted on 19/08/2017 21/03/2019 Categories Cross-cultural management, Japan, Japan - Business culture, Japan - News, Japan - Social issues, News from JapanTags Business, The Diet, working womenLeave a comment on Are women member of the Diet abandoning their duties if they are pregnant? No working mother in picture books for children? I am a journalist of 35 years old with a daughter of two years old. My wife who also has a full time job alerted me recently that little picture books tell stories of a family where both parents work. The number of double income household has surpassed the number of single income one since decades. This fact however is not reflected in children’s picture books in Japan. The journalist in the article interviewed authors and publishers of children’s books and found a still conservative attitude of the publishers. One publisher said, “We can’t go into detail of a model of a family as one family model will make people with other types of family feel “it’s not for me”. Is it the only reason? Why publishers are so much afraid of including working mothers in children’s books, despite the fact that population of mothers who are housewives are less than those who have a job? I see here a strong Japanese attitude of being afraid of the change. Any change will create unexpected consequences in expected and unexpected ways. This is what the Japanese almost automatically try to avoid. It’s not data that convinces the Japanese, but the perception. Thus publishers stick to an outdated model of a family as it is safer than taking consequences of a change. Such an attitude support stability of the Japanese society. This however is a double-edge sward. For the same reason, Japan is keeping a half of its population in a stereo-typed image. Author Yoshiko KURISAKI　（栗崎由子）Posted on 04/08/2017 21/03/2019 Categories Cross-cultural management, Japan - Social issues, Japanese culture, News from Japan, professional womenTags education, Japan, women, working mother, working womenLeave a comment on No working mother in picture books for children?